When you are planning your get away trip you will also look for some activities. And you got too much choose what you can do… You see a lot and sometimes you don’t know what is worth visiting. So today an article with 9 things that are for sure worth it in Budapest. Are you curious what is worth visiting during your Budapest trip? The name are ready reveals what this is… This is namely a covered market. But not just a covered market, because this one is located in a beautiful building. And everywhere where you come you smell delicious food. Here you also find the more traditional Hungarian food for a very reasonable price! This market hall is a combination from food stalls with some touristic shops and like a real market where you can find fresh ingredients. You can find the food stalls mainly above. It’s for sure worth to try out and taste the local food! When you are in Budapest you just have to got to a bathhouse. This city is known for there many bathhouses. I went to the oldest and the popular one namely; Szechenyi. But there are enough unique and beautiful bathhouses, so there is choice enough! My visited wasn’t that expensive. I payed around €13 to use all the facilities the whole day. But the price depends from the season and or it’s a day or evening visited. And a little tip don’t forget your own towels and flip flops. 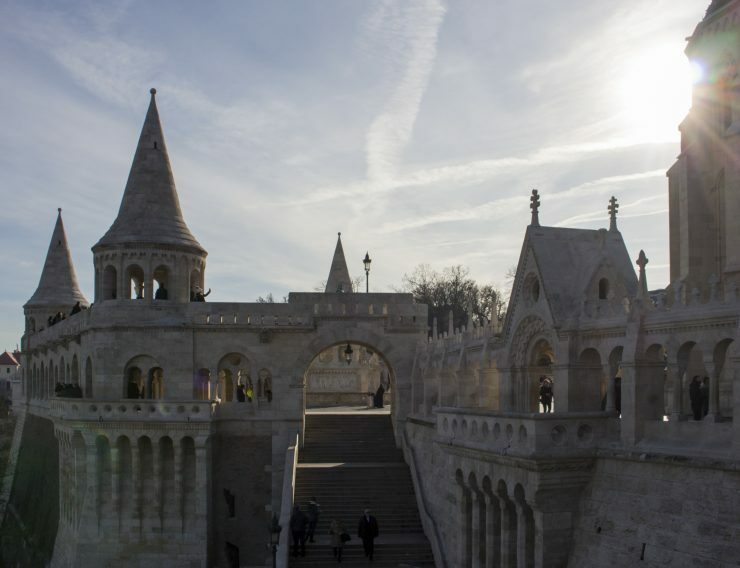 The fisherman’s bastion is one of the most beautiful buildings I saw in Budapest! This is worth the visited! From the bastion you got a beautiful view over Pest. But the bastion itself is also a real beauty and a stunning building. During the winter you can visit a part of the bastion for free, but during the peak season you have to pay for your visited. But you must visited this fairy tale building for sure! Just across the fisherman’s bastion you find the Matthias church. You can admire the outside for free. 😉 But to enter the church you have to pay. If you love churches than you must visited the inside, because this is beautiful restored! I found the inside pretty, but I loved the outside more because of the unique and special architecture. This stunning bridge connect Buda and Pest with each other. You got a lot of other bridges but there is not another one in Budapest that can equal the chain bridge. It’s an impressive bridge where you as foot passenger safely are separated from the cars. So perfect to just take a moment and enjoy the magical view! Buda castle is already beautiful to see from the Pest side. It’s an impressive building. There are museums inside, I didn’t visit them. But what I did was discovering everything from Buda castle, it’s a real discovery with her and there some stunning lookout point over Pest. There is much to discover in Buda castle and this is perfect to combined with a visited to the fisherman’s bastion. The basilica is beautiful from the inside but also the inside is stunning! The inside is impressive thanks to the much golden leaf details. You can also go all the way up for a panorama view above Pest! The entree from is basilica is a free gift, but 200HUF is recommended. That is not much to entree this basilica! And… just near the St. Stephen’s Basilica is gelarto rose located. And here you can eat the best ice cream ever! That is not everything… Because they scoop the ice cream in a rose. The result is just to pretty! The price from the ice cream is for sure not much. And there is enough choice. You got special flavours like white chocolate lavender, sesame seed, coconut,… But there are enough normal flavours like strawberry, chocolate, vanilla. So gelarto rose is for sure worth it! Something that I saw a lot in Budapest where second hand clothing stores. And it’s worth it to bring a little visited to a second hand store! Because you can do for sure some good deals. And who knows you will see some unique and beautiful pieces! My favorite second hands store was cream. There I bought a pretty warm fluffy jacket. These are for sure the must do’s for when you are in Budapest! Oh, and keep an eye on my blog… Because next week there will come an article online about that I got scammed in Budapest. And the week after that I will share some tips so that your stay in this city will be amazing! Wauw!! Wat leuk en wow dat ijs ziet er goed uit! Hehe, ja dat ijs was inderdaad echt te lekker! Leuk! Boedapest staat op mijn lijstje om ooit nog heen te gaan! Super! Want Boedepest is echt de moeite! Budapest is mijn favo stad! Goh, Boedapest stond nog niet om mijn lijstje! Maar nu dus wel! Mooi is het daar zeg! Ooh, zo jammer! Maar in de toekomst moet je het zeker eens opnieuw plannen. Want Boedapest is echt de moeite! De gebouwen zien er zo statig uit. Daar houd ik wel vaak. Er is nog zoveel om te bezoeken..
Wauw, de markthal en het badhuis zien er zo mooi uit! Wat een leuk artikel! 🙂 Ik ben nog nooit in Boedapest geweest, maar de stad staat al jaren op de wishlist. Een vriendin van mij heeft er onlangs een half jaar gewoond en toen kreeg ik echt de kriebels. Al die mooie foto’s, volgens mij is het gewoon een heerlijke stad. En dan die ijsjes: ik krijg er spontaan trek van. Boedapest is hier al eventjes geleden, maar heb wel al deze hotspots gedaan toen! Oh Boedapest wil ik heel graag een keertje doen, je blog zal nog van pas komen dan! Ik vind Boedapest een geweldige stad! Ben er vorig jaar zomer nog geweest (voor de 5e keer..) en stiekem wil ik wel weer terug. Oh, zalig dat je er al zo vaak bent geweest! Dan weet je echt wat daar de moeite is. Prachtige foto’s! Lijkt me echt een geweldige stad om een keer te bezichtigen! Ja, ik kan het enkel aanraden!